The EF-M 22mm f/2.0 STM is a moderately wide-angle fixed focal length lens with the equivalent field of view to that of a 35mm lens and is an attractive option for reportage, street and landscape photography. As with others in the EF-M range it adopts the firm’s new linear stepper motor technology for discreet refocusing using both CD and PD AF during video-capture. It also features slim aluminum barrel measuring just 23.7mm long with a full-time manual focus collar and yet still finds room for a relatively complex construction with 7 elements (one with an aspherical surface) in 6 groups, while focusing to just 15cm and weighing as little as 105g. It has a 55mm filter thread and is available now at $229. 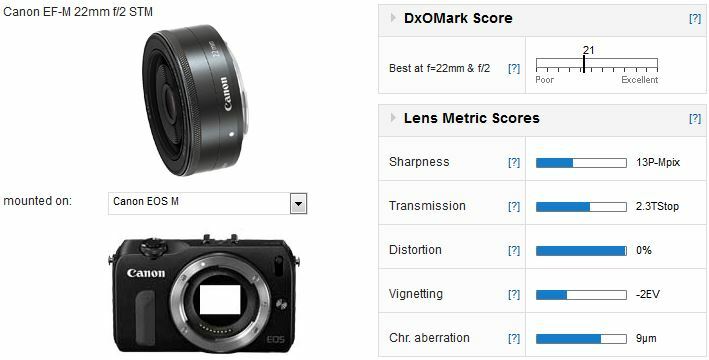 With a DxOMark score of 21 points the 22mm is a decent performer for a high-speed compact lens with a short focal length. Although it has quite high vignetting at maximum aperture it’s well controlled from f/2.8 onwards and it has reasonably low levels of chromatic aberration. Transmission at 2.3Tstops could be better but it’s not unexpected in a lens of this type. Sharpness is high, though, at 13P-Mpix and it has good edge-to-edge sharpness overall though that applies mainly to aperture settings from f/2.8 onwards. We’ve compared the Canon EF-M 22mm with the slightly wider fixed 28mm f/2.8 equivalent found on the APS-C Nikon Coolpix A. 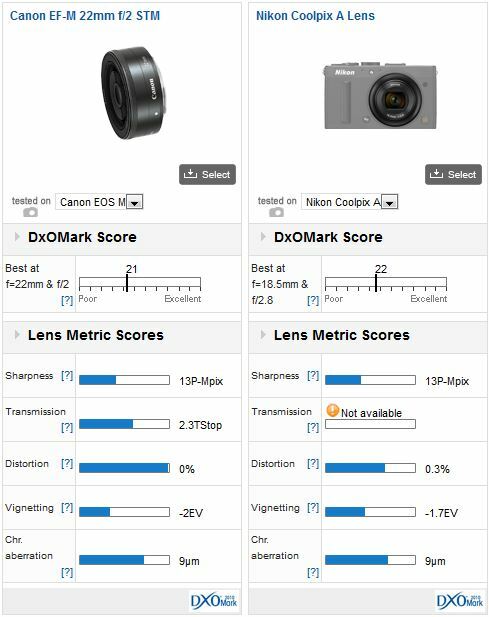 The Nikon lens is just ahead of the Canon, scoring a DxOMark score of 22 but it has similar sharpness, slightly higher distortion and similar CA. Vignetting is lower as well (as you might expect from a sensor with no AA filter and micro-lenses designed to reduce shading) but the two lenses are very close and are both excellent performers overall. 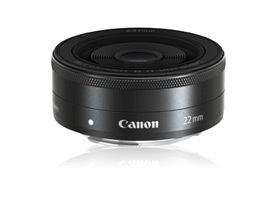 While the EOS M may not have been the mirrorless camera everyone was waiting for from Canon the tiny 22mm f/2.0 ‘pancake’ is a highly desirable lens and good performer optically. Indeed, it would be good to see Canon introduce a similarly specified model in EF-S mount. Ultimately, the 22mm prime bodes well for the EOS M system, and, hopefully, reveals some of the firm’s intentions regarding not just future lens models but also bodies targeting more advanced users.